Walter Newell served as a pilot with No. 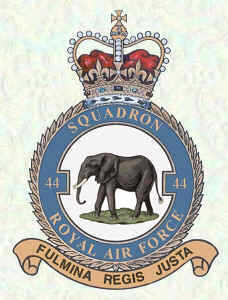 44 Squadron. In 1943 the squadron whose motto was ‘Fulmina Regis iusta’ – ‘The King’s thunderbolts are righteous’, was based at Waddington, Lincolnshire before moving in May of that year to Dunholme Lodge. The squadron was the first to be equipped with the Avro Lancaster Bomber and flew raids deep into enemy territory including the industrial Ruhr and Berlin. On the night of 2nd December 1943 Walter and his crew took off from Dunholme Lodge airfield in Lincolnshire at 1647 hours, in Lancaster III EE179 KM-B, their target was Berlin. The aircraft crashed at Gross Kienitz killing all the crew. Walter lies buried in Berlin 1939-1945 War Cemetery, 8 km west of Berlin in the district of Charlottenburg. Eighty per cent of those buried there are aircrew lost over Berlin and the surrounding area.